The First Continental Congress was a convention of delegates from twelve British North American colonies that met in 1774, early in the American Revolution. Called in response to the passage of the Intolerable Acts by the British Parliament, the Congress was held in Philadelphia, attended by 55 members appointed by the legislatures of the Thirteen Colonies, except for the Province of Georgia, which did not send delegates. The Congress met briefly to consider options, organize an economic boycott of British trade, publish a list of rights and grievances, and petition King George for redress of those grievances. The Congress also called for another Continental Congress in the event that their petition was unsuccessful in halting enforcement of the Intolerable Acts. Their appeal to the Crown had no effect, and so the Second Continental Congress was convened the following year to organize the defense of the colonies at the outset of the American Revolutionary War. The Continental Congresses helped to forge the consensus for the American Revolution and create the pattern for American democracy. Like the Stamp Act Congress, which was formed by American colonists to respond to the infamous Stamp Act, the First Continental Congress was formed largely in response to the Intolerable Acts. The Boston Port Act, the first of the acts passed in response to the Boston Tea Party, closed the port of Boston until the East India Company had been repaid for the destroyed tea and until the king was satisfied that order had been restored. The Massachusetts Government Act unilaterally altered the government of Massachusetts to bring it under control of the British government. Under the terms of the Government Act, almost all positions in the colonial government were to be appointed by the governor or the king. The Administration of Justice Act allowed the governor to move trials of accused royal officials to another colony or even to Great Britain if he believed the official could not get a fair trial in Massachusetts. George Washington called this the "Murder Act" because he believed that it allowed British officials to harass Americans and then escape justice. The Quartering Act applied to all of the colonies, and sought to create a more effective method of housing British troops in America. The act permitted troops to be quartered in uninhabited houses, outhouses, barns, or other buildings. The Quebec Act was unrelated to the events in Boston, but the timing of its passage led it to be labeled as one of the Intolerable Acts. The act enlarged the boundaries of the Province of Quebec and instituted reforms generally favorable to the French Catholic inhabitants of the region. Many feared the establishment of Catholicism in Quebec, and that the French Canadians were being courted to help oppress Americans. The idea of a continental congress first appeared in a letter written and published by Samuel Adams on September 27, 1773. In May 1774, New York City's Committee of Fifty-One, called for a continental congress when it issued a declaration: "Upon these reasons we conclude that a Congress of Deputies from all the Colonies in general is of the utmost moment; that it ought to be assembled without delay, and some unanimous resolutions formed in this fatal emergency". The Congress was planned through the permanent committees of correspondence. 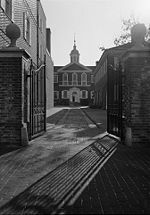 They chose the meeting place to be Philadelphia, Pennsylvania in Carpenters' Hall, which was both centrally located and one of the leading cities in the colonies. The Congress was held in 1774. The Congress met from September 5 to October 26, 1774. From September 5, through October 21, Peyton Randolph presided over the proceedings; Henry Middleton took over as President of the Congress for the last few days, from October 22 to October 26. Charles Thomson, leader of Philadelphia Sons of Liberty, was selected to be Secretary of the Continental Congress. Patrick Henry already considered government dissolved, and was seeking a new system. Pennsylvania delegate Joseph Galloway sought reconciliation with Britain. He put forth a "Plan of Union," which suggested an American legislative body be formed, with some authority, and whose consent would be required for imperial measures. John Jay, Edward Rutledge and other conservatives supported Galloway's plan. (Galloway would later join the Loyalists). The Congress had two primary accomplishments. First, the Congress created the Continental Association on October 20, 1774. The Association was a compact among the colonies to boycott British goods beginning on December 1, 1774. The West Indies were threatened with a boycott unless the islands agreed to nonimportation of British goods. Imports from Britain dropped by 97 percent in 1775, compared with the previous year. Committees of observation and inspection were to be formed in each colony for enforcement of the Association. All the colony's Houses of Assembly approved the proceedings of the congress with the exception of New York. If the “Intolerable Acts” were not repealed, the colonies would also cease exports to Britain after September 10, 1775. The boycott was successfully implemented, but its potential for altering British colonial policy was cut off by the outbreak of the American Revolutionary War in 1775. The second accomplishment of the Congress was to provide for a Second Continental Congress to meet on May 10, 1775. In addition to the colonies which had sent delegates to the First Continental Congress, letters of invitation were sent to Quebec, Saint John's Island, Nova Scotia, Georgia, East Florida, and West Florida. None of these sent delegates to the opening of the second Congress, though a delegation from Georgia arrived the following July. ↑ Norman K. Risjord, Jefferson's America, 1760-1815 (Rowman & Littlefield, 2002), 114. ↑ 7.0 7.1 Evarts Boutell Greene, The Foundations of American Nationality (American Book Company, 1922), 434. ↑ Marion Mills Miller, Great Debates in American Hist: From the Debates in the British Parliament on the Colonial Stamp (Current Literature Pub. Co., 1913), 91. ↑ 9.0 9.1 9.2 Isaac Kramnick (ed.) and Thomas Paine (Author), Common Sense (Penguin Classics, 1982), 21. ↑ In Worthington C. Ford, et al. (eds. ), Journals of the Continental Congress, 1774–1789, 2:192–193. Retrieved June 25, 2008. Bancroft, George. History of the United States of America, from the discovery of the American continent. (1854-78), vol 4-10 online edition Retrieved July 9, 2008. Force, Peter (ed.). American Archives, 9 vol 1837-1853. major compilation of documents 1774-1776. online edition Retrieved July 9, 2008. Miller, John C. Origins of the American Revolution (1943). online edition Retrieved July 9, 2008. All links retrieved April 11, 2017. History of "First Continental Congress"
This page was last modified on 11 April 2017, at 22:58.